Apple is promoting the 2nd generation iTouch as the “Funnest iPod Ever” in a television commercial featuring “Around the Bend”, by The Asteroids Galaxy Tour. 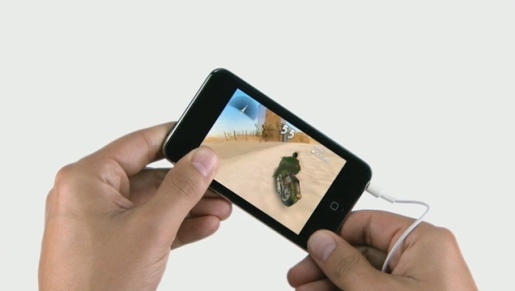 The spot shows a pair of hands moving an iTouch iPod around to play a number of games, including Rollerball and ten pin bowls, before choosing a new soundtrack. The Funner spot was developed at TBWA\Media Arts Lab, Los Angeles, by chief creative officer Lee Clow, executive creative directors Duncan Milner and Eric Grunbaum, creative director Scott Trattner, associate creative director Nathan Iverson, art director Demian Oliveira, copywriter Krista Wicklund, agency producers Mike Refuerzo and Hank Zakroff. Filming was shot by directors Mark Coppos and Virginia Lee via Greendot Films, Santa Monica, with director of photography Rebecca Baehler. Editors were Mike Moore and Glenn Martin at Nomad Edit. Post production was done by Brandon Sanders at Mork & Lys.